This spring I have been quite content in "the beauty department". I haven't bought whole a lot but I feel happy with the select few that I picked up. Browsing and virtual swatching (the "scheming") is the funner part of all this, and the joy is doubled to find out your deliberate choice actually works out on you. Also, these recent months have been abundant in amazing blogsale deals (one example here) and surprises from a generous swap package. Liz of Beauty Reductionista (who is currently hosting a giveaway) kindly gifted this beauty to me. 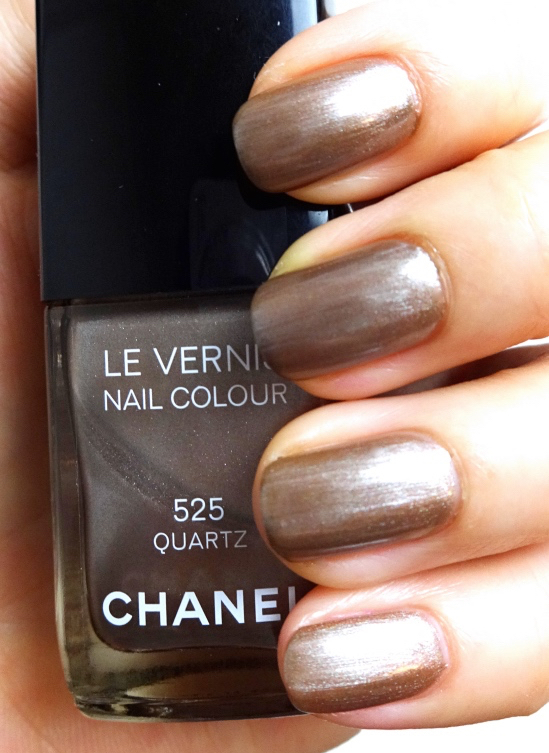 Chanel Le Vernis Quartz is a complex shade yet Chanel merely described it as a "silver beige", which is not too far off, but come on. 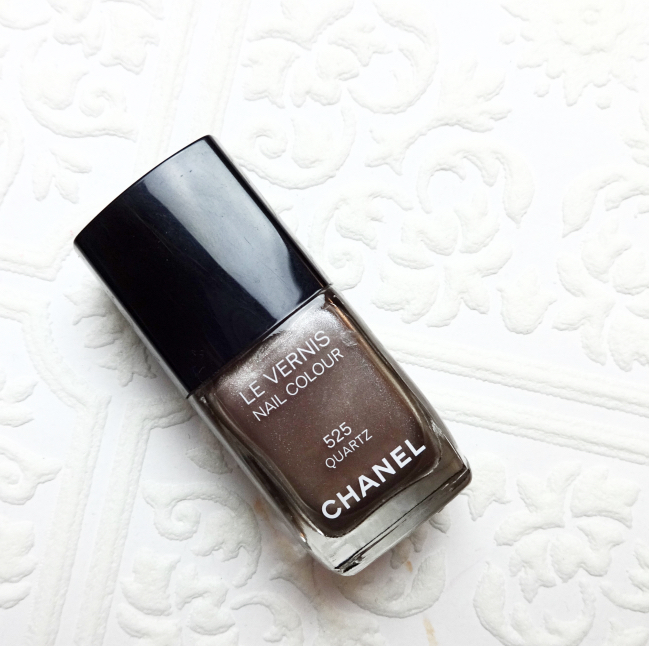 The consistency is about the same as other Chanel nail polishes I've tried. It covers evenly with two coats and dries rather fast. Quartz is a shimmery metallic color but not exactly a foil, so those dreadful brush strokes aren't there. The staying power is about average - 5 to 7 days on me before the tip wears start to show. I love the color so much that I wish I had an eyeshadow in the same color. Or maybe I do; the long-discontinued Chanel Vega. 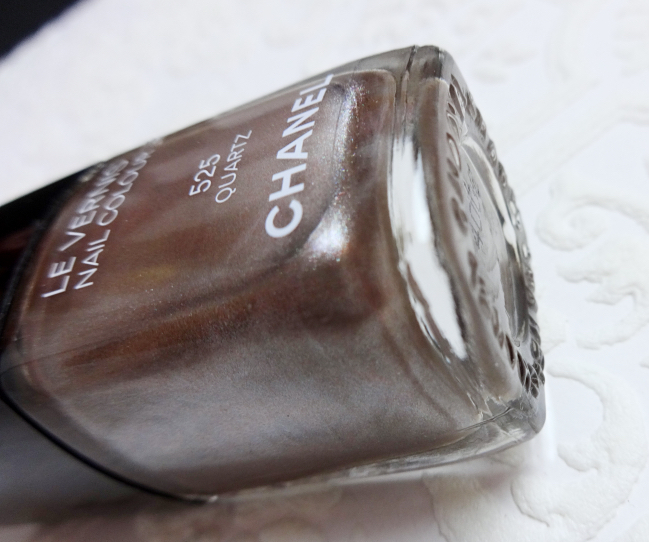 Again, Chanel was so wrong in getting rid of this utterly beautiful taupe. I might start a petition for a repromotion for Vega. Mine is old and dying so I will soon need a replacement. 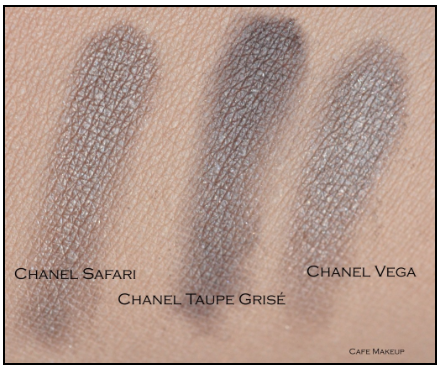 Chanel Ombre Essentielle Safari and Taupe Grisé are close but they are not Vega. Repromote!! Hope you enjoyed this taupe (silver beige) deliciousness. Do you wear shimmery taupe on your nails? Hey Lena, Quartz is such a beauty! I don't think I have anything similar, although I do own Safari. It doesn't look that cool on me tho, which is a good thing because anything that's too grey isn't very flattering on my skin tone. Quartz is one of my favorites!!! I don't wear it often enough!! Pretty pretty! I love taupe anything. I don't think I own similar shades as I am not really a fan of shimmery nail polishes, they look weird on my nails. lol. This is stunning Lena!!! I've never seen a polish like this before but then again I'm not really a polish lover and so I don't often look for new and trending colors! I totally love the finish of this polish, it's super gorgeous! This isn't the kind of nail color I'd spontaneously reach for personally, but seeing it on your nails it looks really pretty. i've never tried a color like this but it looks really nice!